Here’s an overview of our certification program! Read on below to learn more about what it means to be a Formative Certified Educator and how to become one! Feel free to sign up for an optional orientation here and we can walk you through the process! What does it mean to be Formative certified? Being Formative certified means that you are an expert with Formative and all the latest features. It also means that you are effective and passionate about collaborating with other educators in our community. Collaboration is a big part of becoming Formative certified because we believe that in order to most effectively use Formative, one must actively collaborate with other teachers who use Formative. We have thousands of teachers around the world who are finding new ways to drive student growth with Formative and that you can learn from! 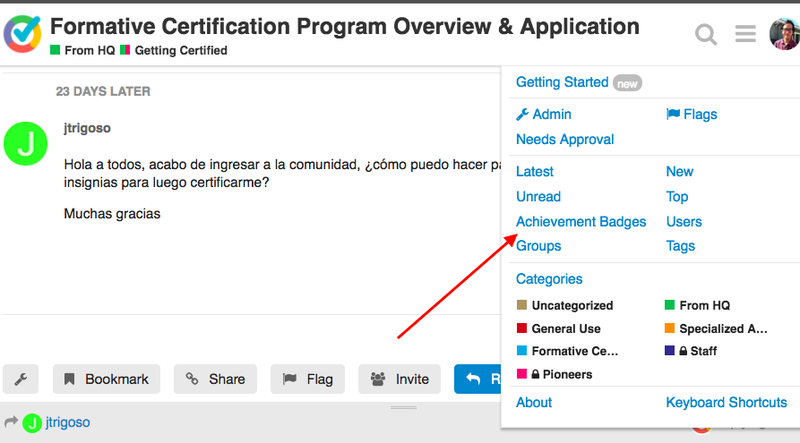 How do I become Formative certified? To become a Formative Certified Educator, you must earn all Level 1 and Level 2 achievement badges in our Community Center. Level 1 badges focus on learning about our community and learning from our growing knowledge base within it. You will earn the title of “Informed Member” after earning all Level 1 badges. Level 2 badges challenge you to start collaborating with other teachers in our Community Center. Once you earn all Level 1 and Level 2 badges, you can apply to be a Formative Certified Educator here. How do I get started if I am new to the community? You can get started by simply learning about our Community Center and earning the Level 1 badges. A great topic to read first is the community overview! As you earn achievement badges you will receive notifications in the top right of your account notifying you of what you’ve earned and you can see all the badges you’ve earned via the Achievement Badges page! Good luck and may the Formative be with you! Hey @admin1 How often are checks done for the awarding of badges that aren’t easy to automate? Hi Kelly! Great question! We update them daily. We are going to create a topic right now, explaining this! We are also strongly considering modifying certain badges so that they can be automated and delivered quicker! Hola a todos, acabo de ingresar a la comunidad, ¿cómo puedo hacer para poder avanzar en ella y obtener mis insignias para luego certificarme? I am using Google translate to chat with you! To become a Formative Certified Educator, you can earn all the Level 1 and Level 2 badges shown here! The deadline for applying to be part of first cohort of Certified Educators is December 4th (next week)! We initiate a second cohort in mid January. Please let me know if you have anymore questions about becoming certified! ¡Estoy usando Google translate para chatear contigo! Para convertirse en Educador Certificado Formativo, puede obtener todas las insignias de Nivel 1 y Nivel 2 [que se muestran aquí] (https://discuss.goformative.com/badges). ¡La fecha límite para solicitar ser parte de la primera cohorte de Educadores Certificados es el 4 de diciembre (la próxima semana)! Iniciamos una segunda cohorte a mediados de enero. Por favor, avíseme si tiene más preguntas sobre cómo obtener la certificación. Hello, I have two accounts, can they also be merged to earn the badges earlier? I am very excited about working towards Formative Certification. I really like what I am doing so far on my own, but being able to collaborate with others will be even better. Thanks. Earn Your Formative Educator Badge! Awesome! Feel free to message me if you have any questions! Hey @new_members @informed_members ! This is just a reminder that the deadline to join our next cohort of Formative Certified Educators is June 13th, 2018! If you are interested, you can finish earning all the Level 1 and Level 2 badges. Then, you can simply apply here! It’s going to be a great summer with many awesome opportunities to collaborate with other Certified Educators and our internal team to make the most of your use of Formative! If June 13th is too soon, you are always welcome to apply to a future cohort! I have 2 more Level 2 badges…then what is the next step? You will love being a part of this innovative community! If June 13 is too soon, approximately when do you foresee the next cohort starting? Great question! The next cohort will most likely start in early-mid July! If you end up applying a few days past June 13th, we can still welcome you into that one! Update: The deadline for our next cohort has been extended to June 26th! Hi David- In NY we haven’t started our Summer. Is it possible to do the Level 1 and Level 2 Badges and apply to the Certified Educators program late? Definitely! Depending on when you apply, we’ll either welcome you into the cohort that we most recently initiated or the next one! We just extended the deadline for joining our most recent cohort to June 26th as well!